i wanted to make this last year- but village living does not let one wander down on a whim & throw into one's basket a styro foam wreath...nor a metre or two of burlap...! is it weird that i haven't owned a glue gun to date? for some reason...i've always assumed that a good wad of craft glue will do the trick...errr wrong people! 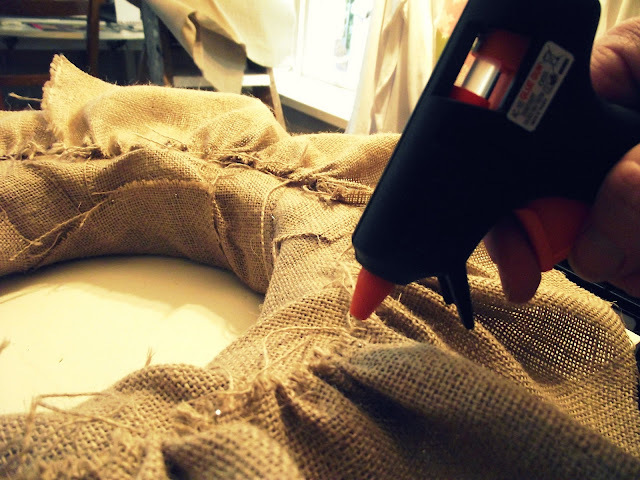 1. cut three lengths of hessian/burlap into 4" x 70" strips. 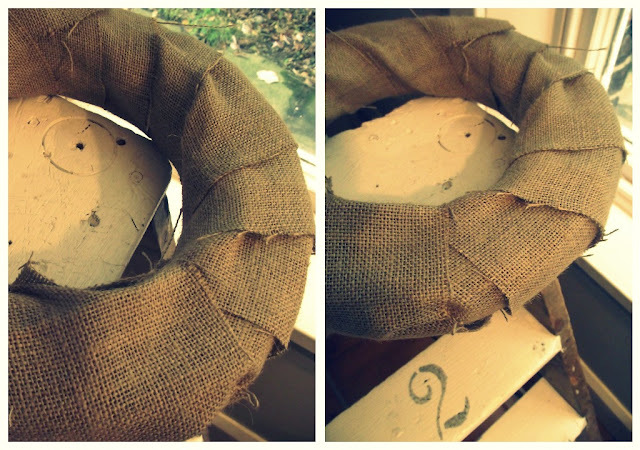 wrap your wreath in one of these strips & secure with flat tipped pins. 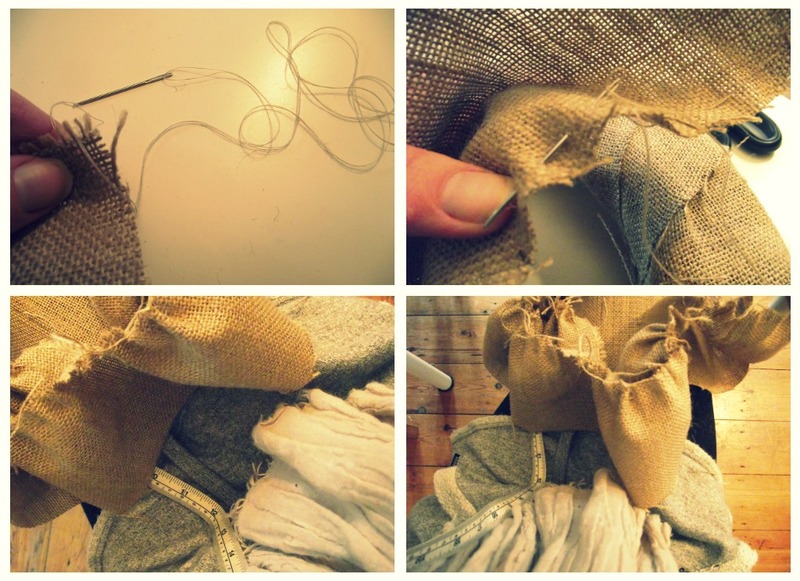 hand sew, a simple straight stitch in & out, the length of the piece & gently pull to gather. 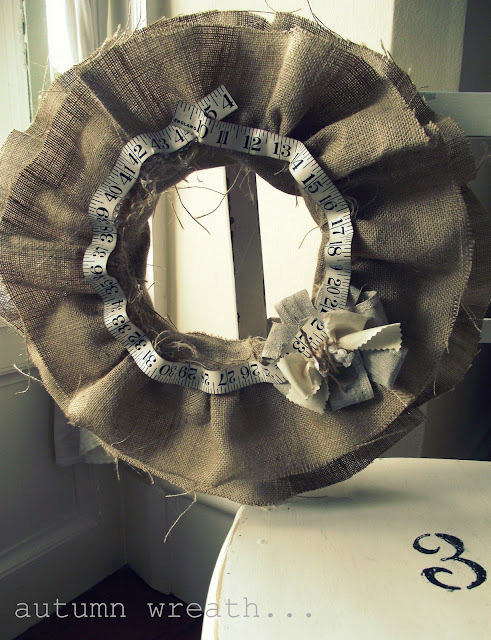 3. when you have gathered the first strip to fit the circumference of your wreath , pin it securely to one flat side of your wreath- just inside the outer edge- this will become the back of your finished piece. 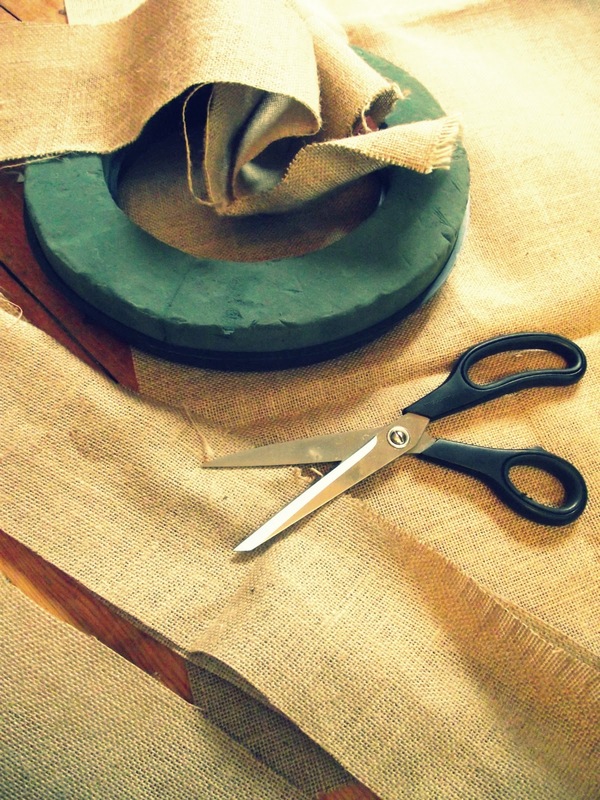 4. once the hessian/burlap has been secured with pins...use your glue gun to adhere all the fabrics together...following the gathered line around the wreath. 6. pin the last gathered strip to the front of your wreath- on the inner edge...& secure as before, with your glue gun around the entire gathered circle. 7. using any left over fabric off cut, hot glue a hook to the back of the wreath...you can also now use any left over fabrics to make a rough flower in which to build your decoration. 8. using a length of fabric fold roughly to create a flower shape & zigzag, or hand sew, together & hot glue to your wreath. 9. allow everything to dry...have a cuppa tea & get ready for the *make-it-your-own* part. i used a vintage measuring tape that i had been keeping for such a project...& incorporated my love of string, rope & calico into the decoration. this year i've got it sorted! This is a completely adorable wreath. Great tutorial too. I would love for you to post this on my Fall In Love linky party today. Oooh! I love it, Melissa! And a great tutorial too! You are officially crowned ruffle queen!!! Melissa!! I flippin' love this, too. 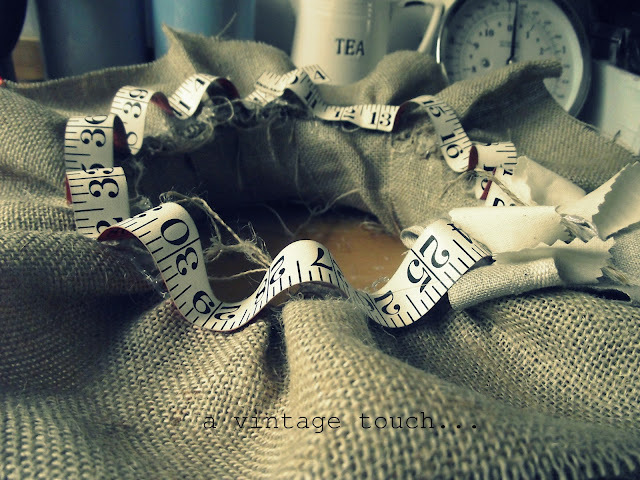 Cute, cute, cute and so *you*...it turned out great and i love how you added your vintage tape measure. Oh the things you are going to think of to hot glue now...I use mine all the time..your crafts will never be the same again!! : ) XO friend. so cute--love it! i especially love the tape measure on it--why didn't i think of that? if you have time i would love it if you would share this at my linky party going on now. 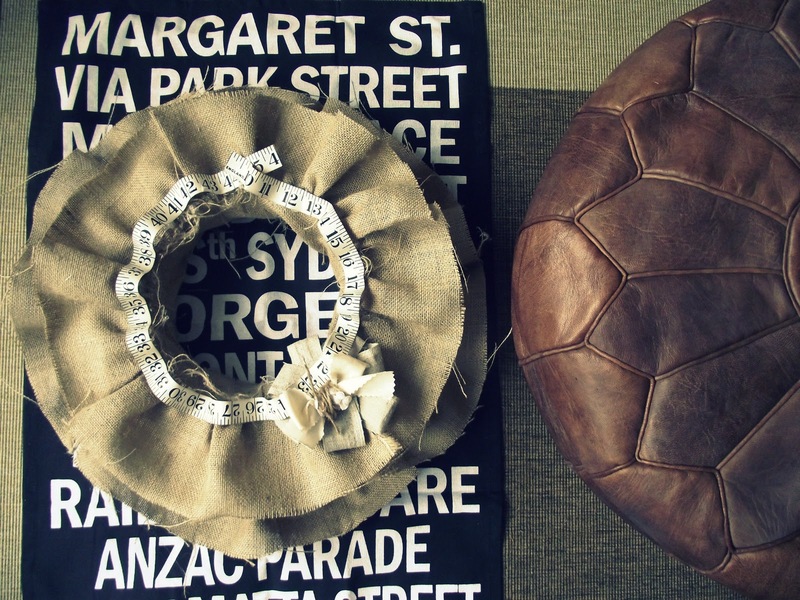 Awesome wreath. Thank you so much for the instructive post. Can't wait to give it a go this weekend. Oh I love it too! GORGEOUS! 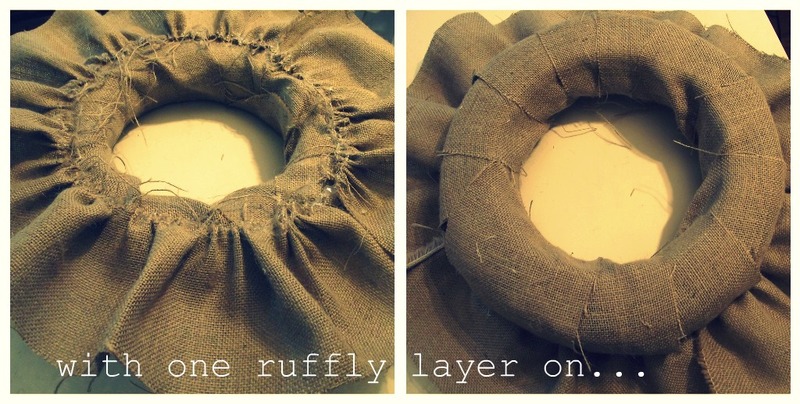 Love your ruffly vintage burlappy style. I'm with you on the local inavailability of anything crafty (Oh how I wish we had a Spotlight here! ), but I reckon I could find these things, at least in time for Christmas. Thanks for the tutorial, it's perfect! really cute!! i love everything involving burlap and your ruffles..thanks for the inspiration. Awesome, the tape measure just makes it perfect. Wowsers! That is B-E-A - Yewtifull! (saying it in my head the way Jim Carey would) The triple bonus though is that I have some hessian - some burlap, a glue gun AND a very cute tape measure (from the Salvos for 20c, all worn and used... you know the lucky find I mean!) And now I have an idea for all 3!!! Yipppeeee! I love this wreath, so pretty and vintage! me thinks i will have to make one :) just loving the ruffles! how fabulously, ruffly, and vintage is that? love it, melissa. i'm hoping you have a fabulous time in malta. soak up a little extra sun for me, my friend. Such a cute wreath. Thanks for the tutorial and thanks for linking up at Beach Cottage Good Life Wednesdays. your wreath is delicious! Love it. Great job! Hello, I've just discovered your blog. I love this wreath. 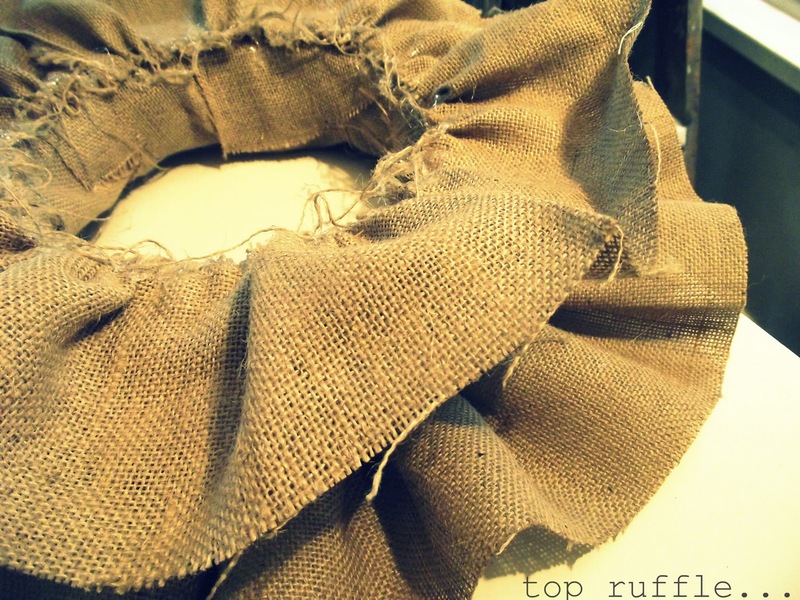 I'm a bit of a ruffle fan you see. The tape measure is a good contrast and something a bit different - fab.